Thousands of sports fans will be descending on Wichita in 2018 – and Visit Wichita is ready to not only host the four events bringing visitors to town, but also showcase the city’s facilities, attractions and energy. Sporting events ranging from NCAA basketball to water skiing are driving the wide range of sports fans to visit Wichita, where they will contribute to the local economy and experience everything the city has to offer. The first of four 2018 sporting events start this month with the 2018 Midwestern and Pacific Coast Synchronized Skating Sectional Championships, taking place Jan. 24-28. The competition will attract more than 160 teams and 2,500 athletes, coaches and their families to Wichita and is estimated to generate more than $3.4 million in local economic impact. Those competing will range in age from seven to 70. All competitions will be held at INTRUST Bank Arena and practices will take place at the Wichita Ice Center. The qualifying teams from the Midwestern/Pacific Coast sectional championships will take on the qualifying teams from the Eastern competition being held in Fort Meyers, Florida. Synchronized skating features teams of up to 20 skaters performing themed routines, lasting less than five minutes and set to music that ranges from Disney classics and Broadway tunes, to jazz, hip-hop and classical. The Midwestern and Pacific Coast Synchronized Skating Championships, hosted by U.S. Figure Skating, is the largest annual qualifying competition in its category. The top four teams from each division will earn a berth to the 2018 U.S. Synchronized Skating Championships in Portland, Oregon. One-day or all-event tickets are available for purchase through Select-A-Seat, online and at the INTRUST Bank Arena box office. Tickets start at $25 and kids ages five and under are free. In March, the first and second rounds of the 2018 NCAA Men’s Basketball Championship will roll into Wichita bringing a highly competitive group of college basketball players, families, fans, visitors and locals to INTRUST Bank Arena. A total of six games will be played in Wichita - four Thursday, March 15, and two Saturday, March 17. The eight teams and thousands of fans who play in and attend the games March 15 and 17 will bring an estimated $10 million in local economic impact. 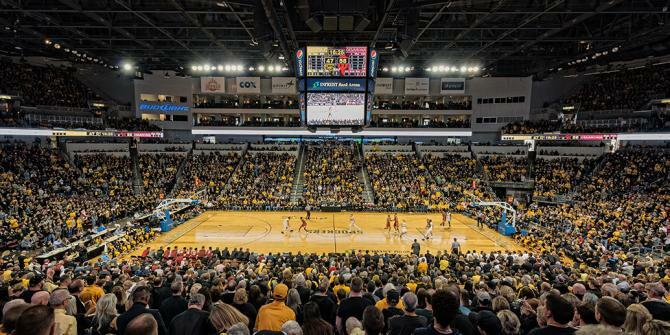 Involved in securing Wichita as a host city was the City of Wichita, INTRUST Bank Arena, Sedgwick County, the Greater Wichita Area Sports Commission, Wichita State University and Visit Wichita. Whether you’re attending the game or not, there will be plenty of activities visitors can enjoy in downtown Wichita, including a rich shopping scene, cultural exhibits, vibrant nightlife opportunities and a Fan Fest area. Check Visit Wichita’s blog at VisitWichita.com/blog for details on tournament-related activities. “Excitement is definitely at an all-time high for NCAA basketball in Wichita,” said Santo. Aug. 7-11, the USA Waterski and the American Water Ski Association National Championships will take place at Mystic Lakes Ski Club, just northwest of Wichita, bringing more than 600 athletes to Wichita to compete. The event will generate more than an estimated $500,000 in local economic impact. The Mystic Lakes Ski Club, which includes world-record capability water ski lakes, has previously hosted the Midwest Regional Water Ski Championships, Junior U.S. Open Water Ski Championships and Barefoot Water Ski National Championships. This year’s event, the nation’s largest water ski celebration, will mark the first time that the state of Kansas has hosted the Water Ski National Championships. On-site crowd areas, including live music, a beer tent, food trucks and more, will be set up for spectators. Ski athletes from across the United States are expected to compete for national titles in slalom, tricks, jumping and overall in respective age divisions and two Open divisions at the Nationals, the world’s largest three-event water ski tournament. Advancement to the Nationals is primarily earned through placement on the national rankings lists. Athletes also can qualify for the Nationals by placing in the top-five at Regionals or by placing in the top-five at the previous year&apos;s Nationals. Wichita will become the center of the bowling world in October when nearly 200 of the top bowlers in the world will arrive in Wichita for the United States Bowling Congress’ (USBC) 2018 U.S. Open, which will take place Oct. 24-31 at Northrock Lanes. Hosting the tournament is a partnership of Northrock Lanes and Visit Wichita. The tournament will generate an estimated $375,000 in local economic impact. during qualifying. Finals will be televised live on Wednesday, Oct. 31.